Now that school has started again, many of us moms are cross-eyed from all the schedules, to-do lists, activities and just keeping it all together from one day to the next. To quote a previous blog post, I often feel “stress-paralyzed” just from writing my to-do list. As I am learning to homeschool, I’m finding ways to help keep things going smoothly and save my own sanity. Whether you homeschool or not, hopefully some of these tips will be helpful to you in streamlining your morning routine! 1. Speed-Chore System: Our mornings were getting off to a slow and frustrating start because my definition of “clean your room” was very different from the seven year olds’ definitions. I created a series of index cards with various lists and tasks for the kiddos to complete. 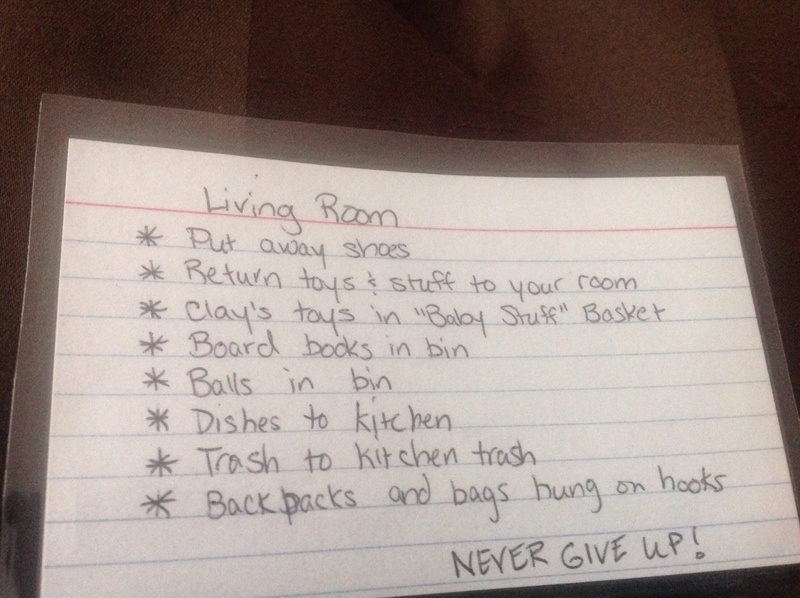 For example, each child has a card for their own room which includes tasks such as: “make bed, close all drawers and closet door, neaten dresser, put laundry in hamper, return toys to bins, place books on shelves”. This helps them to check over the details and be more thorough. They are faster and more motivated now that they have a list to go by. We have a card for each room of the house, as well as a general chore card for each child that they can complete each morning. Cards are laminated and kept in an index card box. (I included a motivating phrase like “Great job!”, “So much neater!” or “Thank you for being such a big help to me!” on the bottom of each card because I know my girls respond well to written praise!) We also have optional “extra chores” that can be completed after the school day and we plan to pay them for these small jobs. 2. Outfit Organizer: Of course, I found this handy organizer second-hand, but it can be purchased from Amazon. 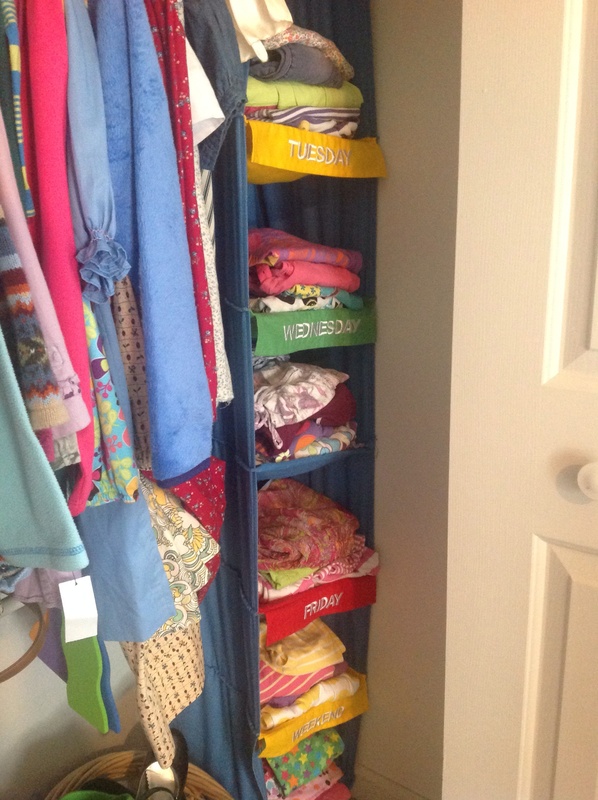 The girls and I attacked their closet this summer and purged any worn-out or too-small clothing items. We like this outfit organizer because of the large pockets which we filled with multiple outfits per day. Now, instead of searching out matching pieces, they can easily grab a whole outfit first thing in the morning. They won’t be stuck with one choice, but have several options per day. The girls are taking over putting away laundry so that they are able to pair the pieces back together before they are returned to the closet. As a mom to twins, with clothing and closet co-ownership issues always facing me, this has made a huge difference. 3. Frozen sandwiches: Some of you could share some amazing lunch ideas that would put this tip to shame, but it helps me on the busy mornings when we are rushing out the door. My kids like frozen peanut butter and jelly sandwiches you can buy at the store; however if I make them myself I can control the ingredients (think whole wheat bread, homemade jam, nut-free butters) and save money. 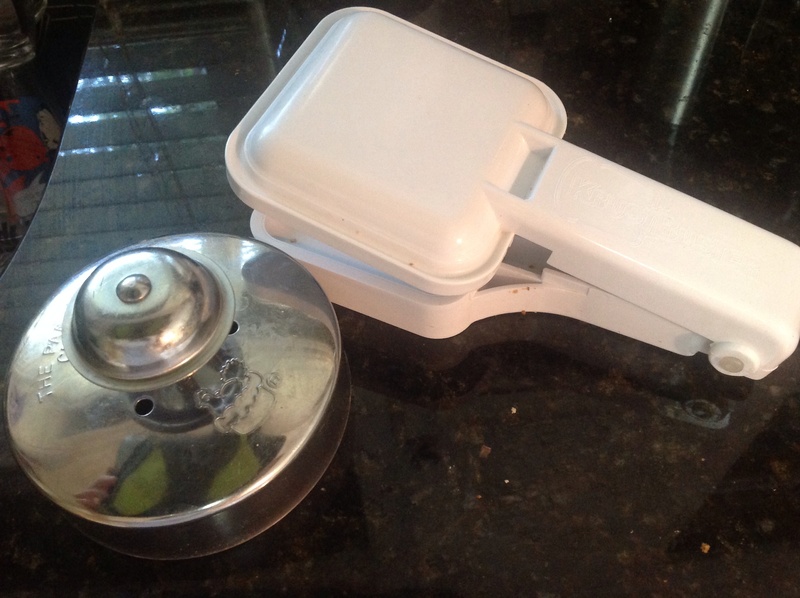 I have two different sandwich presses that I like for this, one from Pampered Chef and one from Amazon. 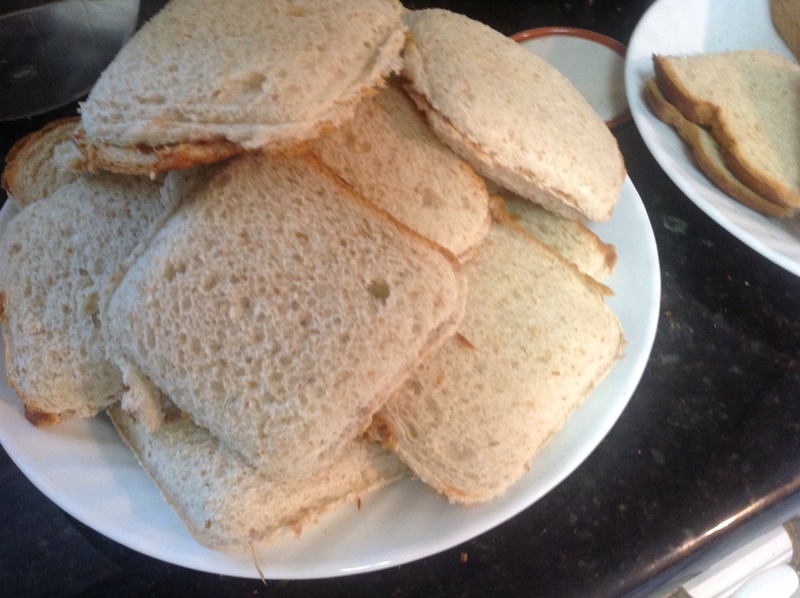 The trick is to flash freeze all the sandwiches before placing them in a large zipper bag, so that you can remove them individually as needed. They stay nice and cool until lunchtime when they will be perfectly thawed. We like to use Itzy Ritzy sandwich bags to carry these along with us. There are plenty of other ideas that could work well for this including: hummus with meat, chicken salad, peanut butter & honey, and fresh fruit with cream cheese. I still make fresh lunches for my kids a lot of the time, but it is great to have a rush-morning option in my pocket (or freezer). If you have tips to help me keep things going smoothly each day, PLEASE share them in the comments! I am the poster child for disorganized and need all the help I can get. Here’s to a fabulous, low-stress, high-learning and fuss-free school year for us all! This entry was posted in Advice, Leah Prescott, Parenting, School and tagged Back-to-school, Columbia, every woman blog, Leah Prescott, lexington medical center., Midlands, Moms, organization, South Carolina by lexingtonmedicalcenter. Bookmark the permalink.